You must have heard the excuse that many school kids tell their teachers when they fail to hand in their assignments on time: "My dog ate my homework!!!". Well now I sympathize with them because my dog just ate my Samsung phone. The screen got 'Cracked' and the battery severely damaged resulting in a useless hunk of trash. As one of the last members of "The Crack Team " without a BlackBerry I now had no other excuse not to get one. 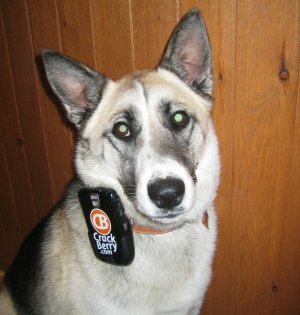 I am currently enjoying my BlackBerry 8700 and my dog is treating my new phone better too. I am now thinking that my dog might be a secret agent from RIM and she purposely chewed up my old phone!